I hope I’m not betraying my own culture when I say that the number of Thai desserts which I don’t care for far exceeds the number of those I like. For one thing, as much as I like coconut, I can only take so much of the let’s-float-some-fruits-or-tubers-in-coconut-milk-sweetened-with-palm-sugar-and-call-it-dessert stuff. Though I do not by any means hate candied taro roots, bananas in coconut cream, or sweet black bean “soup” or others that fall into the aforementioned category of dessert, there are other Thai sweets on which I’d rather spend my daily caloric allowance. 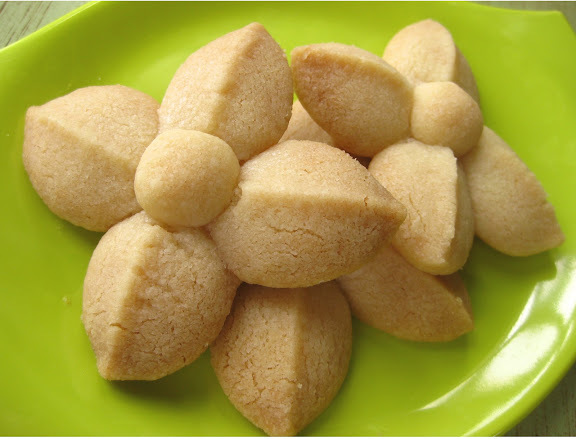 One of them is Kleeb Lamduan (RTGS: klip lamduan) shortbread cookies. I love them so. In the old days, these melt-in-your-mouth sablé-esque cookies were made with lard. Yep. Lard. (Before butter became widely available and before plant-based lipids became the standard cooking fats, Thai cooks had in the pantry a vat of rendered pork fat with bits and pieces of crunchy lardon.) The result was mildly-sweet cookies with a hint of a, not necessarily porky, but savory element. And if you’re one of those who appreciate the delicious combination of salty and sweet in desserts, you know what I’m talking about. Kleeb Lamduan (officially “klip lamduan“) is named so, because they are made to resemble lamduan flowers which have a unique and beautiful three-petal formation. Purist Thai bakers may very well see my four-petal design as punishable by death, but I’m willing to take the sword. I can’t do pretty food. The thing is — traditionally, you create the blossoms by first forming the dough into one-inch balls, cutting each ball into thirds, then joining the tips of the three wedges together to form a 3-petal flower. I know it’s not exactly heart surgery, but I’m too lazy to cut each ball into thirds. I don’t have that kind of mental focus and dexterity. So instead I cut each ball into quarters. That’s easier. Two cuts down the middle — twice. I also messed with another tradition. As is the case with many Thai baked sweets, Kleeb Lamduan cookies are made without added edible scents such as vanilla extract. Instead, these cookies are placed in an airtight container, such as a lidded glass jar, along with an aromatic candle made specifically for dessert-making. The candle is lit and placed in the jar. The lid is then closed to snuff out the candle and trap the aromatic smoke inside the jar. The cookies then absorb and take on the aroma of the smoke. The other departure from tradition is the choice of flour. The traditional recipe calls for all-purpose flour, but I use cake flour here. This is something I have learned from François Payard: cake flour is best when it comes to sablé-type baked goods. Slowly add your fat of choice into the flour mixture and stir with a spoon until the mixture forms a ball with some dry flour on the sides of the bowl. At this point, use your hands to gently mix the dough. You want a smooth dough that is not too wet or sticky and not so dry that it cracks and crumbles when you tear off a piece and try to make a ball out of it. Once a smooth ball is achieved, cover the bowl with a tea towel and let rest 2-3 minutes. Meanwhile prepare one large cookie sheet by lining it with a piece of parchment paper or a Silpat mat. Form the dough into one-inch balls. For each one-inch ball, make a ¼-inch ball — that’s your stamen. Cut each one-inch ball into quarters. With your index finger and thumb, pinch and shape each wedge to form clean, crisp edges. Arrange four wedges on the prepared cookie sheet, conjoining and slightly overlapping the tips of the “petal.” With the tip of your pinkie or the wide end of a chopstick, lightly press the overlapped petal tips to “glue” them together and form a well into which the “stamen” will go. Lightly press a ¼ inch-ball into the well. Repeat. You should have about 15 flowers. Be sure to leave about one inch space between them on the cookie sheet. Let the cookies cool on the cookie sheet before transferring them onto a cooling rack. Store in an airtight container. I measure the dry ingredients by weight, because it’s the most reliable way. I have tried measuring them by volume and found the results to be quite unpredictable. These are so well done. The shape we mean. So great. The lard is an interesting ingredient, and we’re curious to test that savory taste. Yum. Wow! Those cookies are beautiful! I think these are just sooo cute! Leela, the design is beautiful and very *pretty* if you ask me. I am incapable of pretty foods, therefore I pretend that rustic is on purpose. The technique is clever and I can only imagine how yummy they are. I have never heard of the dessert candle before, intriguing. Wow, these cookies sound really intriguing – I look forward to trying. These are lovely! The dessert candle sounds so interesting but I think your substitution of rosewater is great. 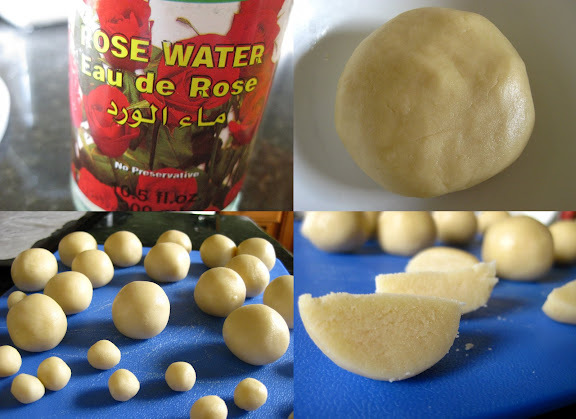 What the heck is ‘Rose Water’, by the way? Rose water is rose extract — kind of like vanilla but smells like rose. I don’t know.. I see a lot of dexterity and feminine grace with the way you made these cookies. ooh, these are gorgeous. okay, i’m a big fan now. Sooo… I know this is kind of late, since you published this recipe over a month ago, but I only just know found your blog. I should have been sleeping two hours ago, but well… You had me totally, completely enchanted. Imagine a starry-eyed, about-thirtyish female in front of her laptop and you get a good impression of what I look like right now. So, first of all, thank you so, so, so, so much for this blog! I love it. And I’m counting out my food allowance money for next month to manage as many of your recipes as humanly possible. Praise now being accomplished I’d like to point one really, really small thing out about this recipe. You say it calls for three petals to look like the original, but to make it easier on the cook, you quartered your ball-shaped dough. And the recipe says it’s good for 15 cookies. So… What’s to stop you from cutting the dough-balls exactly as you did – and then make 20 cookies from those 60 (15×4) petals? Naurael – Cute comment. Thanks. Your question makes a lot of sense and you weren’t the first to ask. Here’s an explanation. First, in order to understand how my mind works, please do your best to think like a very lazy and non-dextrous person. 🙂 What I’ve done here may not be the best way to do it — definitely not the most traditional, but I find it to be the easiest. 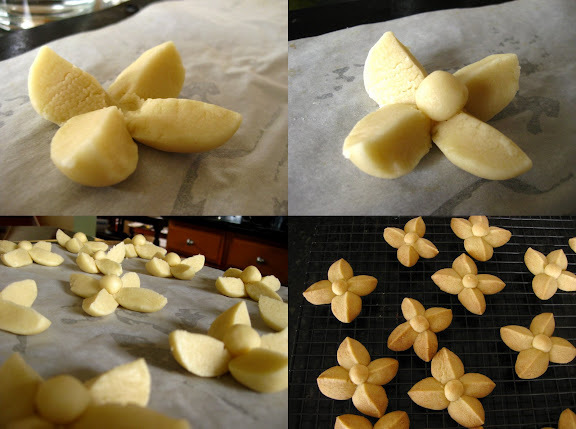 When I make these cookies, I start by forming the flowers by making a one-inch ball at a time. After making each one-inch ball, I make a 1/4 inch-ball right away to ensure that each flower has a stamen. One recipe has pretty consistently yielded 15 one-inch balls and 15 1/4-inch balls. Now, you’re right about the 15 one-inch balls yielding a total of 60 petals after being quartered. And in theory, you could create 20 3-petal flowers out of those 60 quarters. The problem is that after forming 15 3-petal flowers complete with stamens, you will be left with 15 petals without any stamens to go with them. You could turn some of the petals into stamens and continue to make another, oh, maybe 4 3-petal flowers (12 quarters out of 15) and turn the other 3 quarters into four little stamens. For most people, that’s nothing. For a lazy person, it’s just more work than I want to take on. Besides, being non-dextrous, I find it harder to form symmetrical 3-petal flowers than 4-petal ones. I just found your blog while searching for kanom krok recipes and pans. Looks like great fun. But I can’t eat wheat flour anymore, nor can my son…sigh. Hmmm, I did make some almond flour and cocoa powder with butter shortbread cookies once and they were pretty good. Perhaps they could be tweaked into your pretty 4 petal version (I’m with you on 4 instead of 3). Hi Anna – Thanks for the visit. I agree about lard. 🙂 These cookies can be made gluten free by replacing the wheat flour with half tapioca starch and half cornstarch. The gluten free version is even more delicious, in my opinion, due to the extra sandy texture. Leela, these are too effing cute! i’m searching for an easy cookie recipe to have a baking night with a friend and her 8 year old daughter. i hope this recipe makes the cut! i made these again last night. they taste delightful: warmly sweet without making me gag and just the right amount of crumb. i used almond extract cus it was handy. however, they look… ahem. amatuer. i am incapable of forming the petals correctly, and the stamen? have mercy, some of them were bigger than the flowers itself. but i will say, attempting to be like you in the kitchen is just loverly.